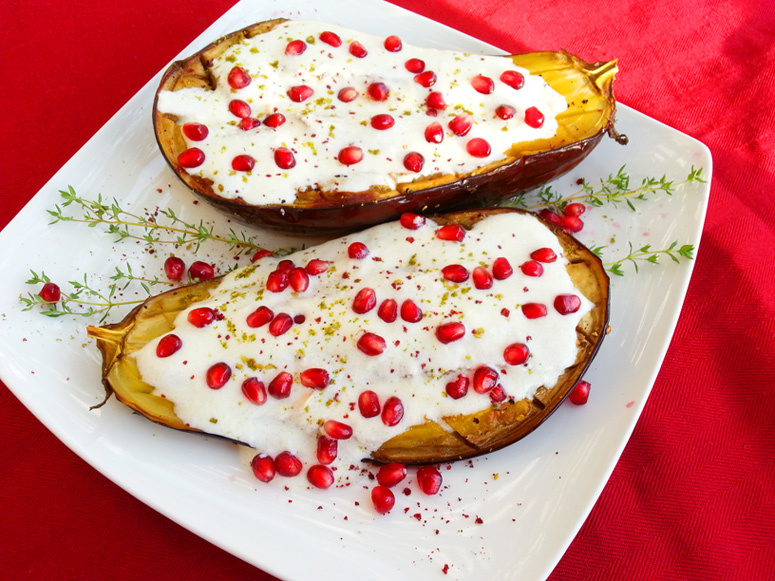 The following eggplant preparation is an adaptation from the recipe in the book “Plenty” by Yotam Ottolenghi. A few weeks ago a friend recommended this book to me, and stressed how great this recipe was., I’m glad I got the book and tried this recipe:- it’s very pretty and delicious, with the tender and sweet eggpland flesh and tangy kefir sauce, it can be served as an appetizer with pita chips or as an entree with a side of cous cous. Brush the eggplant with olive oil, until all of the oil is absorbed. Sprinkle with salt , pepper, and lemon thyme leaves. Combine all the sauce ingredients in another bowl. When the eggplant is soft, place it on a serving dish. Spoon the sauce over it, sprinkle with zaatar and pomegranate seeds.